Congratulations on your purchase of the Maretron WSO100 Ultrasonic Wind / Weather Station. Maretron has designed and built your WSO100 to the highest standards for years of reliable, dependable, and accurate service. The Maretron WSO100 is designed to operate within the harsh demands of the marine environment. However, no piece of marine electronic equipment can function properly unless installed and maintained in the correct manner. Please read carefully and follow these instructions for installation and usage of the Maretron WSO100 in order to ensure optimal performance. This manual corresponds to WSO100 firmware revision 1.0.x . The Maretron WSO100 has the following features. If any of these items are missing or damaged, please contact Maretron. 1. Level with the earth’s horizontal plane – This gives the WSO100 wind / weather sensor the best accuracy of wind speed and direction over the widest range of heel angles. 2. High Enough to have a clear view of the sky to the horizon in all directions unblocked by sails or boat structures – The WSO100 provides the best readings when wind through it is unimpeded by sails or structures on the boat. The Maretron WSO100 can be mounted on top of a 1” 14 threads per inch standard marine pole mount (Section 2.3.1). Screw the included WSO100 mounting bracket to the standard marine pole mount. If you do not have a DSM200 or other display unit capable of configuring installation offset in the WSO100, ensure that the pole mount is oriented as follows. 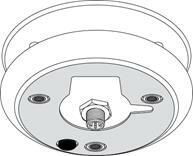 The pole mount base has three small holes for mounting screws and one larger hole for the humidity sensor. Ensure that the small (mounting screw) hole which is nearest the larger (humidity sensor) hole is oriented such that it faces directly forward in the vessel. If you do have a DSM200 or other display unit capable of configuring installation offset in the WSO100, you may mount the sensor in any orientation and adjust for it by configuring the installation offset appropriately (please refer to the display user’s manual for details). Route the NMEA 2000® cable through the standard marine pole mount and the pole mount base and connect it to the WSO100 unit (see Section 2.4 below). Finally, attach the WSO100 to the pole mount base using the included brass mounting screws and lock washers as shown in Figure 1. Do not use threadlocking compounds containing methacrylate ester, such as Loctite Red (271), as they will cause stress cracking of the plastic enclosure. · When installing the WSO100 to a standard marine pole mount, be sure to first screw the WSO100 mounting bracket to the pole mount. Then, attach the WSO100 to the WSO100 mounting bracket with the three screws which connect these two components. DO NOT first attach the WSO100 mounting bracket to the WSO100 with the three screws and then screw the entire assembly onto the pole mount. Doing this will put excessive torque on the NMEA 2000 connector from the attached cable and cause damage to the connector which is not covered under the product warranty. · Likewise, when uninstalling the WSO100 from a standard marine pole mount, be sure to first remove the three screws attaching the WSO100 to the WSO100 mounting bracket. DO NOT first unscrew the entire assembly from the pole mount before removing the three screws. Doing this will put excessive torque on the NMEA 2000 connector from the attached cable and cause damage to the connector which is not covered under the product warranty. The Maretron WSO100 provides a connection to an NMEA 2000® interface through a connector that can be found on the bottom of the device (see Figure 2). 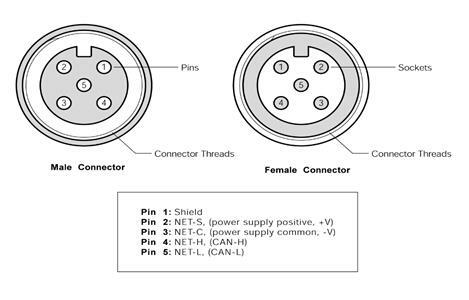 The NMEA 2000® connector is a five pin male connector (see Figure 3). You connect the WSO100 to an NMEA 2000® network using a Maretron NMEA 2000® cable (or compatible cable) by connecting the female end of the cable to the WSO100 (note the key on the male connector and keyway on the female connector). Be sure the cable is connected securely and that the collar on the cable connector is tightened firmly. Connect the other end of the cable (male) to the NMEA 2000® network in the same manner. The WSO100 is designed such that you can plug or unplug it from an NMEA 2000® network while the power to the network is connected or disconnected. Please follow recommended practices for installing NMEA 2000® network products. Once the NMEA 2000® connection to the Maretron WSO100 has been completed, check to see that wind speed information is being properly transmitted by observing an appropriate display. Refer to Section 5, “Troubleshooting”, if no heading information appears. The WSO100 has several configurable parameters, which are shown in the following sections. If you are not using the default values, then you will need to refer to the corresponding section for configuring the WSO100 appropriately. Program this parameter with a text string which identifies this device. Maretron display products will display this label text when you are selecting data to display. You may compensate the wind direction readings transmitted by the WSO100 in order to create a 0° apparent wind direction when the wind is blowing directly onto the bow of the boat. This compensates for installations where the WSO100 is not aligned exactly with the boat’s centerline. You may adjust the damping that the WSO100 applies to transmitted wind speed and direction readings. The WSO100 comes from the factory preset with a damping period of 1.5 seconds, which should be appropriate for most applications. However, you may tune the damping period to anywhere between 0.1 seconds and 5.0 seconds if you desire. If you wish to apply an offset to the barometric pressure reported by the WSO100, you may change the barometric pressure to match the value you wish displayed, which will create and apply an offset to future barometric pressure readings. If you wish to apply an offset to the humidity reported by the WSO100, you may change the humidity to match the value you wish displayed, which will create and apply an offset to future humidity readings. If you wish to apply an offset to the temperature reported by the WSO100, you may change the temperature to match the value you wish displayed, which will create and apply an offset to future temperature readings. Certain parameters do not normally need to be set in order for normal operation, but are included in an advanced configuration section for use in special situations. This entry allows you to program the NMEA 2000 device instance for the unit. You usually will not need to modify the default value of “0” unless you have multiple units on the network. Device instance is always used in the Wind PGNs. This entry allows you to program the NMEA 2000 device instance for the humidity transmitted in PGN 130313. You usually will not need to modify the default value of “0” unless you have multiple humidity sensors on the network. This entry allows you to program the NMEA 2000 device instance for the air pressure transmitted in PGN 130314. You usually will not need to modify the default value of “0” unless you have multiple pressure sensors on the network. This entry allows you to program the NMEA 2000 device instance for the temperature transmitted in PGN 130312. You usually will not need to modify the default value of “0” unless you have multiple temperature sensors on the network. Note that the TMP100 module also generates these PGNs. The WSO100, along with all other Level A certified NMEA 2000 devices, has two user-programmable installation description fields. You may program these fields with information specific to the device, such as date installed, the initials/name of the installer, the physical location of the device, etc. This configuration option will allow you to program the values of these fields. The WSO100 is capable of transmitting NMEA 2000® messages. You may individually enable or disable each of these messages. You may also change the rate of transmission of each of these messages if desired. Selecting this configuration option causes all stored parameters in the WSO100 to be reset to the values they contained when the unit was manufactured. Installation Offset – As shipped from the factory, the WSO100 will read 0° apparent wind direction when the wind blows into the sensor directly from the direction of the post nearest the black humidity sensor that protrudes from the bottom of the sensor. 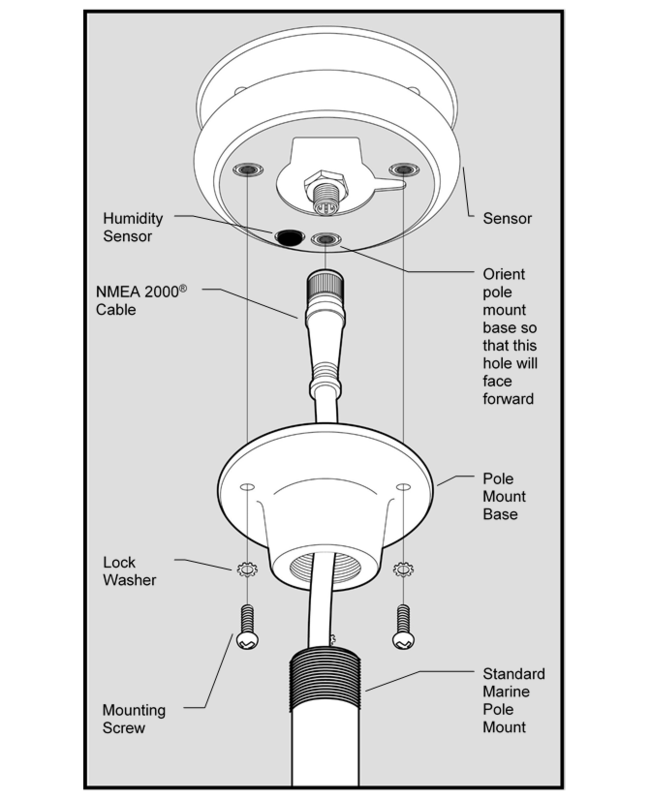 If the WSO100 is mounted with this post facing directly towards the bow of the boat, no adjustment is necessary; however, if the sensor is mounted in any other orientation, the installation offset can be used to compensate the apparent wind direction reading such that it will read 0° when the apparent wind is blowing directly into the bow of the vessel. Wind Speed Damping Period – As shipped from the factory, the WSO100 uses a damping period of 1.5 seconds to filter short-term variations in wind speed and direction and provide a more stable, usable output. This damping period can be changed by the user to increase or decrease the amount of filtering. Periodic Rate of Transmission – As shipped from the factory, the WSO100 transmits PGNs at a periodic rate. Alternatively, a PGN can be disabled by programming its periodic rate to zero. These parameters may be configured using a Maretron instrumentation display, such as the Maretron DSM200, or other NMEA 2000® chartplotters or instrumentation displays with WSO100 configuration capability. Please refer to your chartplotter/display manual for details. Users with direct access to the NMEA 2000® interface may configure these parameters directly through the NMEA 2000® interface. Please refer to Appendix A for a description of the NMEA 2000® messages used to configure these parameters. The wind speed measurement portion of the WSO100 consists of three ultrasonic transducers spaced equally around a horizontally-aligned circle. The wind speed is measured by measuring the time of flight of an ultrasonic sound pulse generated by one sensor and received by the other two sensors. Each of the three sensors takes a turn at being the transmitter, which the remaining two sensors receive the pulse. Wind blowing in the direction of flight of a pulse increases the speed of the pulse by the amount of the wind speed. Measuring the time of flight in both directions between a given pair of transducers allows the speed of sound to be cancelled out of the calculation, making the wind speed computation independent of air temperature and relative humidity. The ultrasonic transducers are robust, yet sensitive instruments. The transducers themselves must be kept free of any coating, such as paint. The WSO100 unit itself, especially the area between the transducers, must be kept clean and free of debris for maximum wind speed and direction accuracy. Clean the unit with a soft cloth. Do not use chemical cleaners as they may remove paint or markings or may corrode the WSO100 enclosure or seals. Do not use any cleaners containing acetone, as they will deteriorate the plastic enclosure. Any spider webs, etc. that accumulate inside the open portion of the WSO100 may be cleaned out with a water spray. Ensure that the unit is mounted securely and cannot be moved relative to the mounting surface. If the unit is loose, tighten the mounting screws. Check the security of the cable connected to the NMEA 2000® interface and tighten if necessary. If you notice unexpected operation of the Maretron WSO100, follow the troubleshooting procedures in this section to remedy simple problems. Ensure that the flow of wind into the WSO100 is not blocked by surrounding structures. Ensure that the flow of wind through the WSO100 is unimpeded and that the unit is free of debris. If these steps do not solve your problem, please contact Maretron Technical Support (refer to Section 7 for contact information). Warning: There are no user-serviceable components inside the Maretron WSO100. Opening the WSO100 will expose the sensitive electronic components to adverse environmental conditions that may render the unit inoperative. Please do not open the WSO100, as this will automatically void the warranty. If service is required, please return the unit to an authorized Maretron service location. Maretron warrants the WSO100 to be free from defects in materials and workmanship for two (2) years from the date of original purchase. If within the applicable period any such products shall be proved to Maretron’s satisfaction to fail to meet the above limited warranty, such products shall be repaired or replaced at Maretron’s option. Purchaser's exclusive remedy and Maretron’s sole obligation hereunder, provided product is returned pursuant to the return requirements below, shall be limited to the repair or replacement, at Maretron’s option, of any product not meeting the above limited warranty and which is returned to Maretron; or if Maretron is unable to deliver a replacement that is free from defects in materials or workmanship, Purchaser’s payment for such product will be refunded. Maretron assumes no liability whatsoever for expenses of removing any defective product or part or for installing the repaired product or part or a replacement therefore or for any loss or damage to equipment in connection with which Maretron’s products or parts shall be used. With respect to products not manufactured by Maretron, Maretron’s warranty obligation shall in all respects conform to and be limited to the warranty actually extended to Maretron by its supplier. The foregoing warranties shall not apply with respect to products subjected to negligence, misuse, misapplication, accident, damages by circumstances beyond Maretron’s control, to improper installation, operation, maintenance, or storage, or to other than normal use or service. THE FOREGOING WARRANTIES ARE EXPRESSLY IN LIEU OF AND EXCLUDES ALL OTHER EXPRESS OR IMPLIED WARRANTIES, INCLUDING BUT NOT LIMITED TO THE IMPLIED WARRANTIES OF MERCHANTABILITY AND OF FITNESS FOR A PARTICULAR PURPOSE. Statements made by any person, including representatives of Maretron, which are inconsistent or in conflict with the terms of this Limited Warranty, shall not be binding upon Maretron unless reduced to writing and approved by an officer of Maretron. IN NO CASE WILL MARETRON BE LIABLE FOR INCIDENTAL OR CONSEQUENTIAL DAMAGES, DAMAGES FOR LOSS OF USE, LOSS OF ANTICIPATED PROFITS OR SAVINGS, OR ANY OTHER LOSS INCURRED BECAUSE OF INTERRUPTION OF SERVICE. IN NO EVENT SHALL MARETRON’S AGGREGATE LIABILITY EXCEED THE PURCHASE PRICE OF THE PRODUCT(S) INVOLVED. MARETRON SHALL NOT BE SUBJECT TO ANY OTHER OBLIGATIONS OR LIABILITIES, WHETHER ARISING OUT OF BREACH OF CONTRACT OR WARRANTY, TORT (INCLUDING NEGLIGENCE), OR OTHER THEORIES OF LAW WITH RESPECT TO PRODUCTS SOLD OR SERVICES RENDERED BY MARETRON, OR ANY UNDERTAKINGS, ACTS OR OMISSIONS RELATING THERETO. Maretron does not warrant that the functions contained in any software programs or products will meet purchaser’s requirements or that the operation of the software programs or products will be uninterrupted or error free. Purchaser assumes responsibility for the selection of the software programs or products to achieve the intended results, and for the installation, use and results obtained from said programs or products. No specifications, samples, descriptions, or illustrations provided Maretron to Purchaser, whether directly, in trade literature, brochures or other documentation shall be construed as warranties of any kind, and any failure to conform with such specifications, samples, descriptions, or illustrations shall not constitute any breach of Maretron’s limited warranty. To apply for warranty claims, contact Maretron or one of its dealers to describe the problem and determine the appropriate course of action. If a return is necessary, place the product in its original packaging together with proof of purchase and send to an Authorized Maretron Service Location. You are responsible for all shipping and insurance charges. Maretron will return the replaced or repaired product with all shipping and handling prepaid except for requests requiring expedited shipping (i.e. overnight shipments). Failure to follow this warranty return procedure could result in the product’s warranty becoming null and void. The WSO100 uses this PGN to provide a regular transmission of apparent wind speed and direction data. The factory default for periodic transmission rate is ten times per second. The transmission of this PGN can be disabled (see PGN 126208 – NMEA Request Group Function – Transmission Periodic Rate). Field 1: SID – The sequence identifier field is used to tie related PGNs together. For example, the WSO100 will transmit identical SIDs for 130306 (Wind Data) and 130311 (Environmental Parameters) to indicate that the readings are linked together (i.e., the data from each PGN was taken at the same time although they are reported at slightly different times). 2: Wind Speed – This field is used to indicate the wind speed in units of 10mm/second. 3: Wind Direction – This field is used to indicate the wind direction in units of 0.0001 radians/second. 4: Wind Reference – This field is set to a value of 0x02 to indicate that the wind reading is an apparent wind speed and direction. The WSO100 uses this PGN to provide a regular transmission of outside temperature, relative humidity, and atmospheric pressure. The factory default for periodic transmission rate is twice per second. The transmission of this PGN can be disabled (see PGN 126208 – NMEA Request Group Function – Transmission Periodic Rate). 2: Temperature Instance – The WSO100 sets this field to a value of 0x01 to indicate that the temperature reading is a reading of outside temperature. 3: Humidity Instance – The WSO100 sets this field to a value of 0x01 to indicate that the relative humidity reading is a reading of outside humidity. 4: Temperature – This field is used to indicate the outside air temperature in units of 0.01°K. 5: Humidity – This field is used to indicate the relative humidity in units of 0.004%. 6: Atmospheric Pressure – This field is used to indicate the barometric pressure in units of 100 Pa. The WSO100 uses this PGN to provide a regular transmission of outside temperature. The factory default for periodic transmission rate is disabled. The transmission of this PGN can be enabled (see PGN 126208 – NMEA Request Group Function – Transmission Periodic Rate). 2: Temperature Instance – This field is used to distinguish the temperature reading from this device from those of other devices. The value of this field is user-programmable. 3: Temperature Source – The WSO100 sets this field to a value of 0x01 to indicate that the temperature reading is a reading of outside temperature. 4: Actual Temperature – This field is used to indicate the outside air temperature in units of 0.01°K. 5: Set Temperature – This field is not used by the WSO100 and is set to a value of “Data Not Available”. The WSO100 uses this PGN to provide a regular transmission of outside humidity. The factory default for periodic transmission rate is disabled. The transmission of this PGN can be enabled (see PGN 126208 – NMEA Request Group Function – Transmission Periodic Rate). 2: Humidity Instance – This field is used to distinguish the humidity reading from this device from those of other devices. The value of this field is user-programmable. 3: Humidity Source – The WSO100 sets this field to a value of 0x01 to indicate that the temperature reading is a reading of outside humidity. 4: Actual Humidity – This field is used to indicate the outside humidity in units of 0.004%. 5: Set Humidity – This field is not used by the WSO100 and is set to a value of “Data Not Available”. The WSO100 uses this PGN to provide a regular transmission of atmospheric pressure. The factory default for periodic transmission rate is disabled. The transmission of this PGN can be enabled (see PGN 126208 – NMEA Request Group Function – Transmission Periodic Rate). 2: Pressure Instance – This field is used to distinguish the pressure reading from this device from those of other devices. The value of this field is user-programmable. 3: Pressure Source – The WSO100 sets this field to a value of 0x00 to indicate that the temperature reading is a reading of atmospheric pressure. 4: Pressure– This field is used to indicate the atmospheric pressure in units of 0.1Pa.